Why RoundTrip International Travel Insurance? 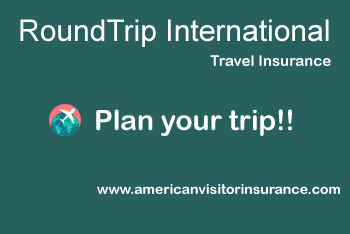 RoundTrip International is a comprehensive trip protection insurance for non US residents traveling outside their home country for up to 30 days. This plan covers property coverage like baggage delay and sports equipment rental coverage. The plan offers protection for trip costs, medical expenses, and luggage for worldwide travel. Trip cancellation and trip interruption insurance for Non-US residents travelling outside their home country. U.S. citizens residing abroad cannot buy this plan for travel to the United States. This plan covers return of minor children, trip interruption and cancellation. Comprehensive plan provides exhaustive coverage when compared to fixed or scheduled benefit plans. The plan pays for all expenses after the deductible and co-insurance component. The plan is recommended given the high costs of health care arouond the world. The plan is worth every penny of premium paid in the event of catastrophic medical emergencies. These plans do not have benefit limits based on the type of medical expense. Trips can be expensive! Don’t lose the money you paid for your trip if you get sick and can’t go. Let us help! Will you have medical coverage while you are traveling? Don’t risk getting stuck with unexpected medical bills if you become sick or hurt on your trip. You packed important items in your luggage! We can help replace them if they are stolen, lost, or damaged during your trip. Care or Treatment for which compensation is payable under Worker’s Compensation Law, any Occupational Disease law; the 4800 Time Benefit plan or similar legislation. There are plenty of amazing destinations around the world that people would want to visit during their lifetime. Others might want to travel overseas either for work or to visit friends and family. Given the access to information and the technology available it is not difficult anymore to plan an international trip. Everything you need is available on the internet. Address Restrictions: We cannot accept an address in the United States, Islamic Republic of Iran, Syrian Arab Republic, U.S. Virgin Islands, Gambia, Ghana, Nigeria, and Sierra Leone. Destination Restrictions: We cannot cover trips to Islamic Republic of Iran and Syrian Arab Republic. * Up to the lesser of the trip cost paid or the nonrefundable cancellation penalty(ies) imposed by the travel supplier(s).